As a youngster I always listened to music, whether it be listening hidden under the bed clothes on my transistor radio on headphones to Radio Caroline, or Radio 2 and Radio 3, or when I was doing my homewor; I have not discounted Radio 4 for it had things like the Navy Lark, Round the Horne, The Goons, Alistair Cooke’s Letter from America etc. Today I am still a devotee of radio in all its forms, and I have it setup on my laptops, tablets, phone and I also have a smal digital portable radio and a Sony Walkman which is now over 10 years old and still working perfectly. Over time my musical tastes have widened to encompass jazz. Of course, I don’t like all jazz, I’m not a fan of Dickie style jazz, or jazz that seems to forget the rhythm (if it ever had any to start with). But I love the jazz you associate with speakeasies, those smokey havens of people who were keeping low and hiding away from the world. But, I hear you ask, what has this to do with the LGBT community? As a society we often feel that we are unique in how we have been persecuted; but as I delve into the history of jazz and its performers I am dismayed to see how often music and musicians have also been targets of a society that just didn’t understand. Indeed, quite often jazz has also been seen as a scapegoat for society’s ills. This was brought home to me again by an article on Billie Holiday – The War on Billie Holiday, by Johann Hari. 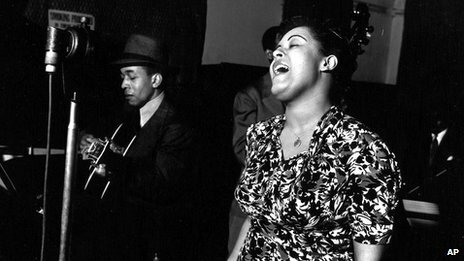 In his article he writes how the Treasury Department in the USA told Harry J. Anslinger (head of the FBI) he was wasting his time taking on a community (jazz) that couldn’t be fractured, and that their efforts would have a far greater impact if they focused on a single target – someone well-known, like Billie Holiday. The result of this unjustified targeting, was that Billie Holiday was sent to jail, and as a former convict, she was stripped of her cabaret performer’s license on the grounds that listening to her might harm the morals of the public. She wasn’t allowed to sing anywhere that alcohol was served—which basically excluded her from every jazz club in the United States. I know, society was different then – prejudices and phobias were the rule rather than the exception. But it’s a fact: we in today’s LGBT community are being targeted in similar ways with the same element of prejudice. Even today, in various parts of the world, gay people are thrown off high-rises, beheaded, lynched and stoned to death, lashed, chemically castrated and even sent to camps for so-called ‘conversion therapy’. Doesn’t this sound a lot like what has happened to every minority group in history? We as a community need to keep ourselves informed. We must turn out and vote in elections, and show that we will not be sidelined whether it be over a cake, a hotel room, a kiss or just holding hands walking down the street. We must always be sure to stand up for our rights.